Our understanding of ancient life is incomplete. There are perfectly understandable human reasons for this: many fossils waiting in the field have not yet been discovered, and many of those that have been discovered have not yet been described (i.e., our knowledge is incomplete). But there are also many natural biases that limit our ability to fully reconstruct the history of life on Earth. Some of these have already been addressed in Section 1.2. For example, certain ancient environments favored rapid burial, while others did not. Additionally, some organisms are much more likely to leave behind fossils than others (a snail's shell is more likely to be preserved than the body of a squishy worm). These biases have resulted in a fossil record that is highly incomplete and is biased towards preservation of particular ancient environments and types of organisms. The fossil record itself is part of the broader geological record, which includes all of the rocks around the world—both at the surface and below it—that document Earth’s very long history. The geological record itself is highly incomplete. As Ovid noted, time is “the devourer of all things” and erosion has always been at work wearing away Earth’s surface, removing large chunks of history from some areas, but leaving it buried in others. The geological map of the northeast and upper midwest United States shown below demonstrates the incompleteness of the rock record visually. Different colors correspond with rocks of different ages at Earth’s surface, with older rocks buried beneath. In some places, very old rocks are exposed at the surface (reflecting one or more intervals of extensive erosion), while in other places, geologically young rocks are exposed, reflecting very little recent erosion. 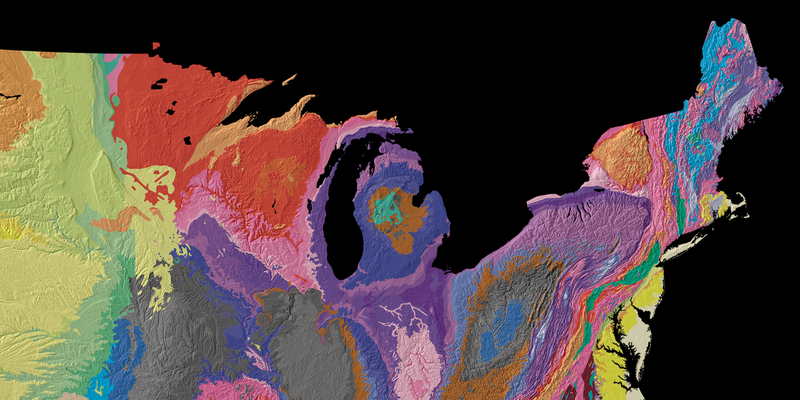 The red and orange colors in northern Wisconsin, Minnesota, and the Upper Peninsula of Michigan indicate Precambrian rocks that formed billions of years ago, while the green and yellow colors on the western portion of the map indicate much younger rocks. Geological map of the northeast and upper midwest of the United States. Modified from the United States Geological Survey "Tapestry of Time" (Public Domain). For example, dinosaurs likely once scampered about present-day Wisconsin during the Mesozoic Era (252 to 66 million years ago; light-green colored rocks), but glacial activity during the Pleistocene (2.6 million to 12,000 years ago) scrapped away this entire interval of history, leaving behind only much older rocks at the surface. This is why no dinosaur fossils have ever been found in Wisconsin (but numerous fossils of much older Silurian-aged life--indicated by the purple shading--have been found). But that glaciation event left alone many Mesozoic-age rocks in the western interior of North America, leaving begin an excellent record of dinosaur life in places like South Dakota, Montana, and Wyoming. “For my part, following out Lyell’s metaphor, I look at the natural geological record, as a history of the world imperfectly kept, and written in a changing dialect; of this history we possess the last volume alone, relating only to two or three countries. Of this volume, only here and there a short chapter has been preserved; and of each page, only here and there a few lines.” (Darwin, 1859, p. 310-311). The image below helps to drive this view home. The photograph shows two strikingly different rock layers preserved at the Black Canyon of the Gunnison National Park in Colorado. The dark colored rocks (Black Canyon Gneiss) below the white line are Proterozoic in age and formed approximately 1.7 billion years ago. The yellow rocks (Entrada Sandstone) above are Jurassic in age - a mere 180 million years old. Therefore, the line represents a missing interval of geological time that spans 1.5 billion years! This missing time interval (termed an "unconformity" by geologists) is known as the Great Unconformity. While this might sound mysterious, it really is not: all of the rocks younger than the Black Canyon Gneiss and older than the Entrada Sandstone were eroded away at this location prior to the formation of the Entrada Sandstone. 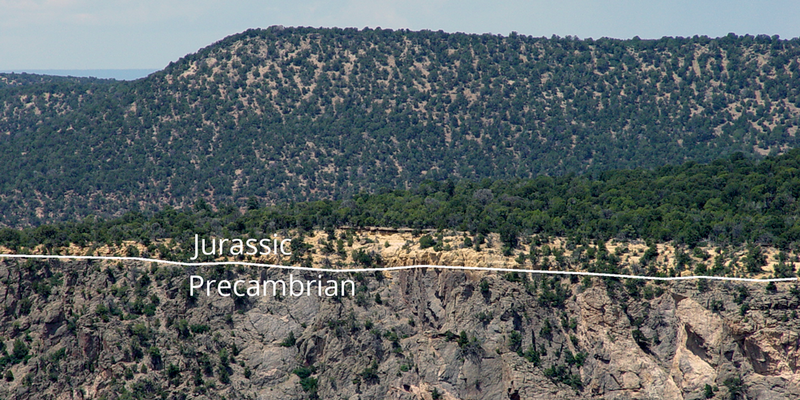 This photograph shows the Great Unconformity at Black Canyon of the Gunnison National Park. Image by Jonathan R. Hendricks. This work is licensed under a Creative Commons Attribution-ShareAlike 4.0 International License. If the geological and fossil records are so incomplete, how then can we know anything about the history of the Earth and its life? The answer is that even though no complete sequence of rocks exists anywhere on Earth, nearly all intervals of geological time are present somewhere, and often in multiple places. Geologists study these shorter intervals of the geological record and then compare them with intervals that are slightly older or younger from other places. Large-scale syntheses of these comparisons allow a generalized understanding of Earth’s long history to be determined. The same approach allows a generalized description of Earth’s history of life to be written. Even though a significant majority of ancient animals, plants, and other organisms did not leave behind fossilized remains, enough did to allow the ancient history of life to be understood. For example, paleontologists use quantitative approaches like phylogenetic systematics to understand the relationships between modern organisms and their ancient relatives, as well as to determine the sequence and timing of their evolution. Nobody alive today witnessed the American Revolutionary War firsthand, but the documents and artifacts preserved provide proof that it did happen. We also know the dates and sequences of major events and the principle participants, even if we do not know the name of every soldier involved. Every written history has gaps in knowledge, but that does not prevent development of a generalized understanding of key events. Documenting the history of the Earth and its life is no different. The next chapter (Geological Time) explains how geologists understand geological time and reconstruct Earth's long history.